It was in 2000 when Priyadarshan's film Hera Pheri released and since then it has emerged as one of the most iconic comedies in Bollywood. Starring Akshay Kumar, Suniel Shetty, Paresh Rawal — the film was full of rib-tickling punches, memorable dialogues and spot-on performances by all the actors. 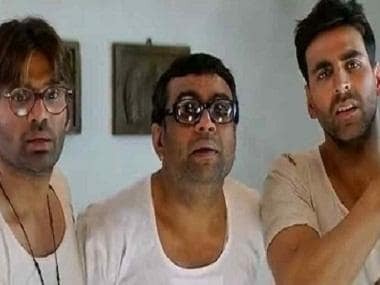 What made Hera Pheri stand out among Bollywood comedies was its sharp and intelligent writing, which did not compromise with the humour quality just for the sake of it. Later, a sequel — Phir Hera Pheri — directed by Neeraj Vora followed in 2006. Now it is reported that the third installment of the film is in the pipeline, with Indra Kumar (he has directed comedy franchises like Masti and Dhamaal) taking over the director's chair, as per a report by Mumbai Mirror. Producer Sajid Nadiadwala reportedly intends to title the upcoming film Hera Pheri 3. It will be shot on a start-to-end schedule starting from December 2018 through February 2019, adds the Mirror report. The actors have also locked their dates for the film. Speculations around a third installment surfaced when a picture of Akshay and Suniel went viral on social media. Mirror, in the report, quotes a source close to the film, who says that the film will be a tribute to Phir Hera Pheri helmer Neeraj Vora who passed away in December 2017. Apparently, Vora had planned to make a third part soon after his film turned out to be a box office success. He had in fact locked in the script, dialogues way back in 2014 and planned to get into the pre-production stage in 2016. But he unfortunately, slipped into the coma in October that year. With Indra Kumar holding the reins now, Hera Pheri 3 seems to be a joyride. The film is slated to release sometime during the second half of 2019, adds the Mirror report.